Ever wondered what falling backwards out of a plane humbles one to think? Hmmm, something just doesn’t seem right. From there, the thoughts tumble into quick succession. Oh look, there’s a plane up there that I was just in a second ago. Weird. I mean really, really wrong. This was probably the worst (and last) decision I’ll ever make. If only I squeeze my eyes and fists and concentrate really hard I’ll go back up. Well, if I do only have three more minutes to live, I really should enjoy the view. Nothing quite puts perspective on groundlessness like literal groundlessness. Our lives, so full of all attempts to maintain control of our surrounding areas (be that physical, mental, or emotional) sometimes needs a sideways air current, arms extended, is-that-ground-below-me-approaching-at-a-rapid-speed kind of jolt. Although not a fanatic of extreme adrenaline-producing activities, I understand that sometimes a little real fight or flight produces states of stress our brains and bodies are biologically designed to handle, with a definite start and stop. Juxtaposing this to our normal chronic stressors, we can experience a moment of reset. In addition, these spaces in-between allow us a moment of serious reflection on why we make certain choices (say, thinking it a good idea to jump out of a plane), or how we need to take personal responsibility (such as admitting you made the choice to be 10,000 feet above ground and falling quickly toward it), and finally, leaning in to your decision (well, if the chute doesn’t open, not much I can do now, so just enjoy the ride). Of course, that sweet feeling of relief when the parachute does indeed open gives you a moment of realizing, “Oh yeah this is why I pushed myself to do something that was a little nuts and not my normal Thursday behavior.” You get an all-around new perspective. And once you hit ground, you always can decide if you want to do it again. Sometimes complete surrender to exactly where we are is really all we can do. So if you’re in some need of getting some new eyes on our planet and/or your mind, may I suggest the following? Jump out of a plane. Remember, you don’t have much control after that so take personal responsibility for your choice to hurl yourself toward the ground at an incomprehensible speed. Make sure to pull the chute when it’s time (or have the giant Brazilian man strapped to your back pull it). Enjoy the scenic glide down until boots hit the ground. Remembering that decisions we make every day truly affect our point-of-view can give us what we need to allow ourselves to release, trust, and fly. What about you? 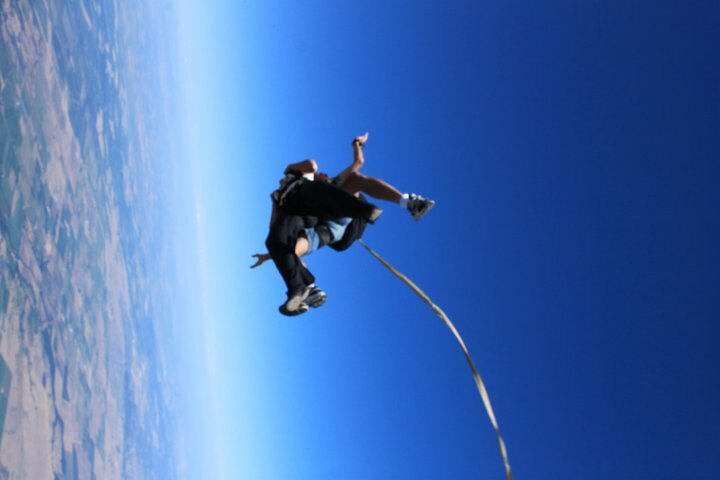 Ever thrown yourself into 120 mph terminal velocity? Do you remember your most poignant/insane/inspiring thoughts? Please share.